When and if the history of the dawn of the age of cloud computing is written, the record will show that, in its early days, while Salesforce.com got a lot of the attention, NetSuite was the first cloud software company. While talk of the cloud has been dominating every aspect of Oracle OpenWorld, the massive tech conference that runs through Wednesday Thursday in San Francisco, NetSuite CEO Zach Nelson has been delivering key applications to help executives run their businesses, large and small, from the cloud. Salesforce and NetSuite were effectively founded as a result of a single 1998 conversation involving Oracle CEO Larry Ellison, Salesforce CEO Marc Benioff and Evan Goldberg, NetSuite’s current CTO. After another company Goldberg had started crashed and burned, Ellison asked him what he wanted to do next. His answer, as Nelson told me by phone yesterday, was a software company like Siebel Systems, but one that delivered a customer relationship application via the Internet’s pipes, without having to be installed on a local machine. While Ellison invested in them both, it is NetSuite that is known affectionately as “Larry’s other company.” Now NetSuite is on track to report sales north of $300 million for the year. It next reports earnings on Nov. 2 and is currently in a quiet period, so Nelson couldn’t talk about the state of business right now. Even so, later today, Nelson will take the stage for a keynote at Oracle OpenWorld. He’ll have some news to make: NetSuite today announced a new two-tier version of its enterprise resource planning (ERP) software that connects to Oracle’s E-Business Suite. 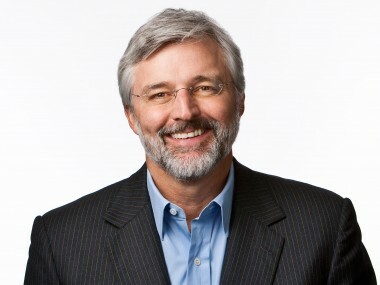 While NetSuite has traditionally been the kind of cloud company where software is accessible to smaller and mid-sized companies, with tens of thousands of customers and an average deal size of $50,000, Nelson says it is starting to move upmarket, penetrating ever larger companies and subsidiaries of major multinational companies. Nelson explained it like this: When those large multinational companies run ERP software, they tend to standardize on Oracle or its primary competitor SAP. “These are systems that are architected for $2 billion corporations, but not for the next tier down, the $200 million subsidiary,” Nelson said. Those smaller units would run a mixture of ERP systems geared to the midmarket companies like Sage in the U.K., Great Plains in the U.K. and MYOB in Australia. “It was like a Tower of Babel,” Nelson says. Examples of companies already taking this two-tier approach include Pitney Bowes, which runs SAP at the corporate level but NetSuite in certain divisions. Procter & Gamble uses NetSuite to run several divisions in Asia; at the corporate level, it’s an SAP shop. “That’s the existing two-tier environment today,” Nelson said. Now those subsidiaries are turning to NetSuite OneWorld, using it to connect with the parent’s Oracle system. Today, NetSuite announced a new version that’s geared toward this “two-tier” approach. With new versions of NetSuite OneWorld and new SuiteCloud Connectors for Oracle, customers should be able to see a fuller picture of what’s going on across the entire corporation, without the silo effect that tends to happen within subsidiaries and divisions. NetSuite also announced that numerous partners will be reselling it, including Dell via its cloud-integration service Boomi, IBM via its Cast Iron Systems integration unit, as well as Pervasive Software and Informatica.